Paige is one of more than 20 VISTAs we helped place at member organizations across the state as part of our VISTA Summer Associate Program. Our Summer Associates work full-time for 8-10 weeks between June and August on projects that can include direct service as well as traditional capacity building activities. As a Public Health major at Tulane University, Paige’s VISTA project at Respond Now relates directly to her interests and skills. 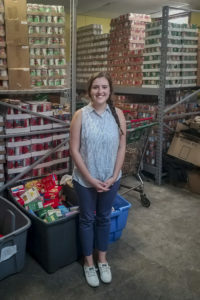 For the rest of her term, she will be researching food deserts, conducting a resident survey in English and Spanish about food insecurity, and compiling a white paper that details the nutritional and health disparities in Chicago Heights, Illinois. Respond Now hopes to use her research to explain the local need for expanding their food pantry and hunger program.